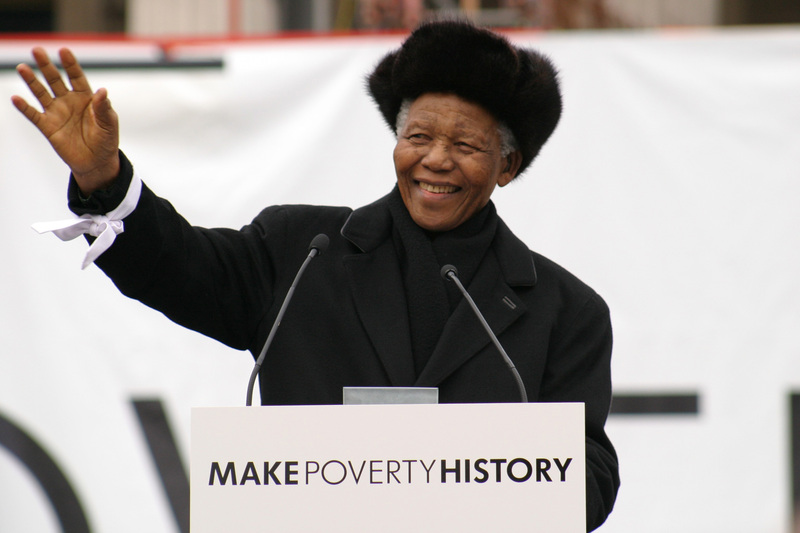 Make Poverty History is an international campaign to end poverty through trade justice, dropping debt and more and better aid. It’s based largely in the UK where the G8 conference will be held in July. The Make Poverty History web site features a number of ads from the TV campaign as well as excerpts from recent documentaries on poverty. The ‘Click’ ads (depending on which version) bring together Brad Pitt, Bono, Kylie Minogue, P Diddy, Cameron Diaz, Jamie Foxx, Miss Dynamite, Kate Moss, Hugh Grant, George Clooney, Alan Rickman, Colin Firth, Lenny Henry, Emma Thompson, Claudia Schiffer, Bob Geldof and Liam Neeson. As performers click their fingers, viewers are reminded that every three seconds a child dies from extreme poverty. ‘Click’ was screened on nearly all commercial channels in the UK on March 31st. There are also USA, German, Canadian, French, African and Indian versions being filmed. Filming was shot by director Marcus Tomlinson via Radical Media, with producers Jon Kamen, Frank Scherma and Greg Schultz, directors of photography Morgan Susser, Jake Polonsky, Erik Messerschmidt, Vic Losick and Adam Beckman. Editors were Andy Keir, Josh Pearson and Jon Schwartz at Outpost Digital. 38 singers, actors and religious leaders talking about the challenge of poverty, include Brad Pitt, Penelope Cruz, Jeffrey Wright, Susan Sarandon, Edward Norton, Cameron Diaz, Salma Hayek, Al Pacino, Antonio Banderas, Holly Hunter, Benicio Del Toro, Alfre Woodard, Justin Timberlake, Djimon Hounsuo, Jewel, Orlando Bloom, Bono, Kevin Bacon, Mary Louise Parker, Ryan Gosling, Sean P Diddy Combs, Jack Valenti, Dennis Hopper, Noah Wyle, Kate Bosworth, Ellen DeGeneres, B.D. Wong, Rita Wilson, George Clooney, Viola Davis, Kate Hudson, Steve Buscemi, Frank Griswold, Pat Robertson, Jamie Foxx, Cameron Diaz, Mos Def, Tom Hanks. This will be great news for people playing Six Degrees of Kevin Bacon. Thanks to American Rhetoric for the information. Orange get in on the act with a texting campaign featuring Ewan McGregor filming on poverty in Africa. Filming was directed by Bryan Buckley with Hungry Man for Mother London.